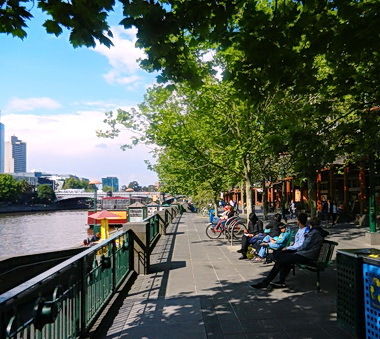 Melbourne, just recently named the most liveable city in the world, wrenched that boasting right from Vancouver. Vancouver, has now been relegated to the third rung, not the second. A time for reflection as the world keeps on moving. Status quo is not an operative word if one wants to be on the first rung. If one wants to be the boaster. makes this city so great to live in? No rapid transit line for one to take to downtown core, as is the case in Vancouver or Seoul. 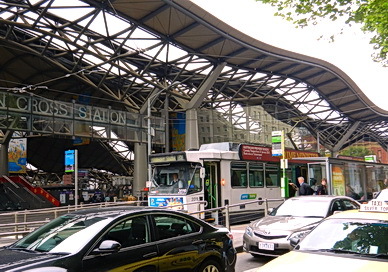 Just a high frequency bus service to the Southern Star railway terminal, that runs every 10 minutes, 24 hours a day. The bus is a specially configured articulating bus that wheels passengers through the 20 minute ride to the railway station. Not like Eugene Oregon’s bus. There is no space for bicycles on the bus. There is no cycling facility easily spotted that lets one cycle to the city. Maybe there is, but where? 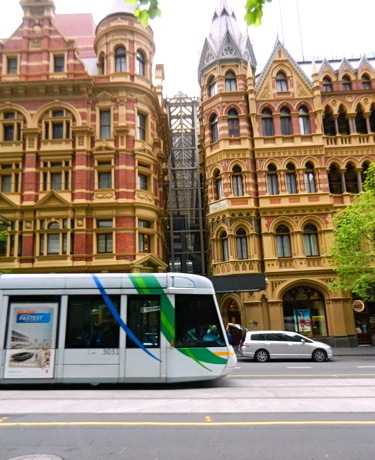 The downtown core, Melbourne’s prime real estate asset, is all about business and retailing. It is all destination shopping and working, since there are no places for people to live. Slowly, residences are being introduced into the city both downtown and also into the docklands as well as other small real estate properties that fall within the City’s boundaries. Imagine, a city where the overnight inhabitants are primarily hotel guests. That is the City of Melbourne. river flanked by retail outlets on the land side willing to feed your appetite or pacing yourself along the downtown shopping streets, one is not alone. You are just an entity among a mass of people vying for sidewalk space. Storefronts are open to streets as feet traffic brings warm cheer to merchants. Some laneways have been populated with tables and chairs for serving food and drink, places where people now rule where cars were once here. Slowly, streets are reconfigured and squeezing our cars by only leaving essential service and delivery vehicles to do their job. Instead, there are stream of pedestrians, cyclist, and tram riders with noise of conservation on the streets, instead of engine noise and pollution emitting from exhausts. Impressions of this city: It does feel like nirvana when encountering one arterial street after another with ribbons of steel down the centre of the roads. With motorists who do not enter the tram space, the steel network allows efficient and fast service through downtown. Each tram swishes from stop to stop, carrying about 200 or 300 customers to downtown live. An extensive network of metro trains brings in 1,000 people at a time from the proliferation of suburban homes. Downtown life without cars is made possible by a high service tram network, supplemented by a dense network of cycling facilities, and also wide sidewalks. With 4.1 million inhabitants, Metro Melbourne encompasses 30 municipalities. The roads are not under the control of the municipalities, but of the state. Joint planning is just a new word here. Street priority and allocation of space may not meet the needs of City of Melbourne’s priorities. Something to work on. 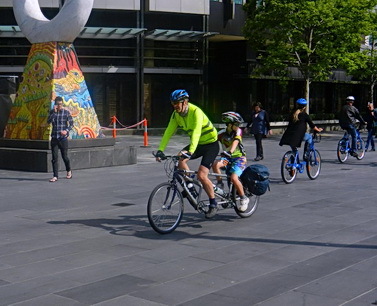 In Metro Melbourne, the vision for cycling seems to be providing a true capacity for people to embrace that mode of transportation to destination. The vision does not seem to include combined mobility with transit beyond the most frequent European model of cycling, to a train station and leaving your bike there. 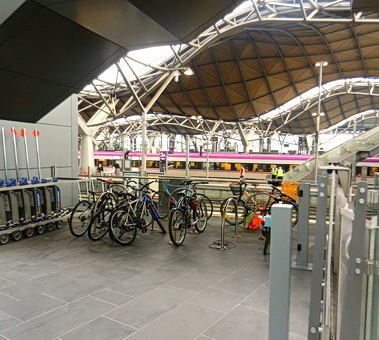 In fact, Parkateers or caged bike parking seems to be springing up in suburban train stations. Suburban train cars may have the European design with place for bicycles but none are allowed. Nor are they allowed on trams or buses. No bike racks on buses here. 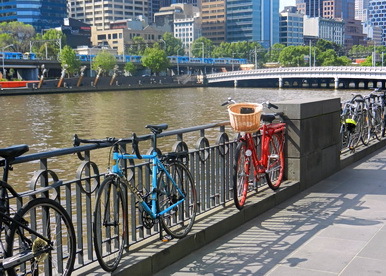 There is a punt or a bike ferry that makes its way across the Yarra River to allow faster commutes to the west. politicians and city staff. It seems that there is a culture of wearing helmets while cycling in Melbourne. If one forgets to wear one’s helmet one day, a passing motorist may just roll down the car window and remind you of that. Implementation of the scheme by the state, without consultation with the city emerges as an issue. The system was introduced during the winter, with no spring advertising and marketing program. The bike stations are not dense enough with a catchment area that would appeal to potential customers. The stations are not located close enough to where potential customers want them. The system is run by an automobile club that is not inspired to market the system nor make it a winner. Nuisance is a word frequently heard instead. Now back to the helmet. Despairing remarks have been made that the provision and access to helmets was not well thought out. One does not see briefcases on the street designed for carrying a helmet or backpacks with that provision. 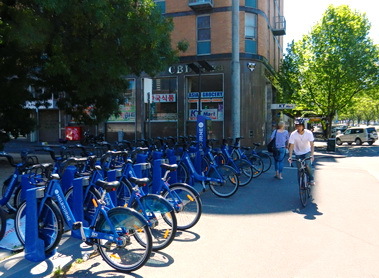 The city does have an extensive network of bike lanes for cycling the public bikes. The philosophy seems to be squeeze in whatever you can without disturbing the movement of cars, the parking of cars, the stopping of trucks, or the stopping of cars all on bike lanes. After all, for a metro area where comments have been made that there are more streets for car,s than in other cities, is this not what one would expect. Sometimes when cars are lined up next to the bike lane, the lane is so wide that one needs to use the curb and push the bicycle forward in the less that half meter space. On the positive side, there are designated spaces for cycling and the cycling lanes are painted green. Will it encourage many motorists to cycle who are not the most confident or skilled? I doubt it. The network design toolkit is extensive with small catchment areas to the closest cycling facility. The infrastructure design toolkit has any concept in it that one can find in any city. The combined mobility toolkit is limited to cage parking at suburban train stations. The social marketing toolkit is minimal, including bike to work day celebrations and cycling maps. The most prominent design from infrastructure design toolkit that is evident on the streets, is the advance green painted stop boxes with bike stencils. Beyond that, bike horizontal and vertical separation from cars with bike lanes, can be found easily. 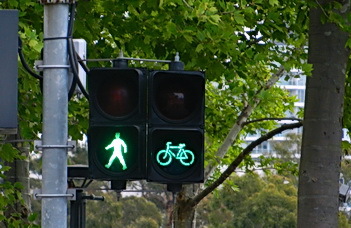 In new developments like the Docklands, more comprehensive designs can be found, along with bike signals. However there, the bridges are not really intended for cycling. 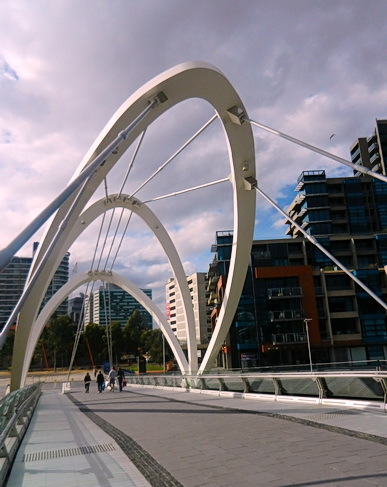 The Docklands is a stretch of waterfront lands that is being transformed from old industrial use to residential and commercial use. Not bad. Though not to the level of European people streets. While sitting on a bench along an old pier, an urban planning student approached me and asked questions. He and his mates are working on a uni project. What do you like about this development? What needs to be done to it? After my dissertation on the topic, he advised that their polling of Dockland users, brought forth the same thinking. Simply, the strengths of the Docklands combined with Vancouverism along the waterfront, would yield a very desirable people street and places that would compete with the best of what Europe can offer. 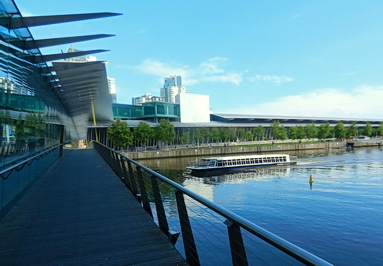 Sterile is the most predominant word used to describe the Docklands. The architects have not quite left the 1960’s and 80’s to join in with the best of Vancouverism architecture that makes people streets and places. What really stands out from visiting Melbourne for a couple of weeks, are the trams system and the right hook turns that cars make when the street have tram tracks. One is used to seeing cyclists do it, but not cars. Melbourne a windy city that grows on you.